A cat who doesn’t use the litter box usually gets a big reaction from the humans. But did you know there are proactive steps you can take BEFORE your kitty ever has litter box problems? With a few simple actions, you can help guide your feline friend to use the box faithfully. 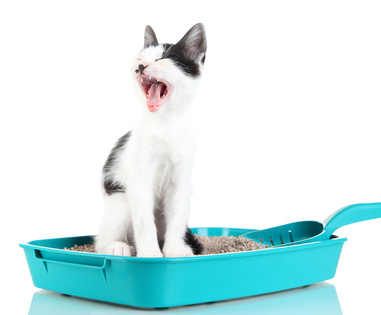 It’s never too early—or too late—to build gold star litter box habits! 1) New Adult Cat? Confinement is Key! When you’re bringing a new cat or kitten into your home, it’s very important to start things off on the right paw. Adult cats are creatures of habit, so change can be hard for them. When your new friend first comes home, you can ease her transition by confining her to a small space (without hiding places you can’t access), such as a bathroom. Fluffykins should stay there until she has established the habit of using the new litter box. It might seem tempting to let your new friend roam right away, but don’t give in! Large, open spaces are usually frightening for cats at first. An anxious kitty is more likely to avoid the litter box—or hide and get too afraid to come out and find it. In particular, older cats, recently neutered cats, and very shy kitties may need more time than you think. Better to err on the side of caution: some cats do best in a new environment with a month or more of confinement. Slow and steady wins the race to impeccable litter box use! 2) New Kittens? Confinement is Still Key! Kittens simply haven’t been around long enough to build long-term box habits yet. Not to mention that finding the box in a big space is hard when you’re little and you really gotta go! Temporary confinement to a bathroom or other small room gives new kittens the best start. Confinement for young kittens, especially when they’re unsupervised, is important for establishing life-long gold star litter box habits and may be necessary for weeks or even months, depending on the kittens and the home situation. It’s a process not to be rushed: think short term pain (not having your kittens next to you all day long) for long term gain (A+ litter box users). Once the kittens are out for short supervised visits, keep showing them where their box is and reminding them to try to use it. Spaces that seem perfectly normal to people can be extra scary for kitties. To you, for example, the dryer is a handy time-saving appliance. To Fluffykins, it might seem like a big cube monster, ready to emit scary clunks and beeps at any second. Nobody wants to go potty next to a monster! When deciding where to place litterboxes, try to take a kitty’s-eye-view. Is the box easy to access? Is the location quiet and private? Is it easy to get in and out of? Kitties usually prefer boxes that offer quick escape routes—you never know when that dryer monster might try to ambush you! For this reason, hooded litter boxes and boxes hidden in furniture can be unappealing to certain kitties. Having the right number of litter boxes is as easy as can be! If “C” is the number of cats in your household, then C + 1 = Number of Boxes. In other words, make sure to have a litter box for each kitty, plus one extra box. (Sorry, two boxes right next to each other still count as one!) Cats can be territorial about their litter, so having plenty to go around—in different locations—helps prevent problems. While some litter box issues are behavioral, many result from medical problems. Urinary tract infections, crystals, pain from declawing, constipation, arthritis… all of these health problems, and many others, can lead to box avoidance. Make sure to take your kitty in for regular check-ups. Not only will your kitty earn that gold star for good behavior—she’ll be happier and healthier, too! 6) Clean It Like You Mean It! If your kitty does have an accident—or if you spill while cleaning—be sure to get rid of the mess right away with an odor-neutralizing cleaner, available at most pet stores. If you can, it’s also a good idea to block off kitty’s access to that spot for a while (especially if that spot is a bed). Awesome article! I am a new kitty owner and need all the tips and tricks! Super resourceful!